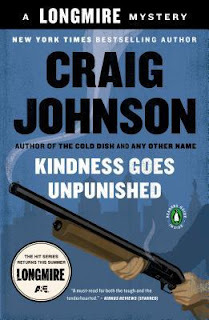 Kindness Goes Unpunished (Longmire Mysteries #3) by Craig Johnson is available at Amazon, Barnes and Noble, and BooksAMillion. Walt brings Western-style justice to Philadelphia in this action-packed thriller from the New York Times bestselling author of The Cold Dish and As the Crow Flies, the third in the Longmire Mystery Series, the basis for LONGMIRE, the hit A&E original drama series. Fans of Ace Atkins, Nevada Barr and Robert B. Parker will love New York Times bestselling author Craig Johnson's mystery series—starring Walt Longmire, the straight-shooting sheriff of Absaroka County, Wyoming, and the basis for LONGMIRE, the hit A&E original drama series—-is attracting more and more fans with its distinctive blend of humor and action. In Kindness Goes Unpunished, Walt's pleasure trip to Philadelphia to visit his daughter, Cady, turns into a nightmare when she is the victim of a vicious attack that leaves her near death. Walt is forced to unpack his saddlebag of tricks to mete out some Western-style justice, and the result is another action-packed thriller from this star of crime fiction. I'm a lover of both ale and wine and I love books that give me a reason to pair alcohol with my reading sessions. I especially enjoy when a book mentions a specific beverage that I can enjoy while reading (it helps pull me into the book). This book is best served with Yuengling. I came to Longmire by way of the show and I've mentioned in previous reviews that the show is true to the books in the same way that Midsomer Murders was true to Caroline Graham's books: the show captures the essence of the characters but takes liberties with plots, which keeps both formats fresh for viewers. This book is the book that will stick in one's craw, if you're one of those people who want the show to be exactly like the book. It's apparent that the show deviates from two on-going plot-threads in the book-series. The first: Cady's story-line in the book-series changes to make room for Branch on the show. In this book, we go back to Philly with Cady and learn a lot about her life that hasn't made it into the show yet. It will be interesting to see if and how the show ties back into Cady's story-lines in the books. The second, Vic Moretti. We meet her family, which the show hasn't done, and it turns out that they are all cops too, which gives us the opportunity to understand Vic better - we see where she's coming from. Then, we meet her new lover. I don't want to give spoilers but this plot-thread has NOT happened on the show and, all I can say, my jaw dropped. I wasn't expecting it. I'm definitely curious to see if the show ever goes there. And again, even though the book-series is going in a different direction from the show, I love both formats because I feel like I get double the Longmire.